When Paul O'Neill golfed a home run off Dwight Gooden on a down-and-in pitch in the top of the first inning of Game 4, it represented a characteristic that would come to be standard for this growing Yankees dynasty: Joe Torre's hitters worked pitchers deep into counts and wore them down. That was the fifth pitch of O'Neill's early at-bat, immediately following a six-pitch at-bat by Derek Jeter, and ultimately Gooden would fail to last five innings after throwing 92 pitches. That home run also was notable because it was all the scoring New York needed in a 4-0 victory at Cleveland that proved pivotal in the Yankees' six-game triumph. The Indians, still smarting from their loss to the Marlins on a Game 7 walk-off hit in the World Series, wanted to get back there and could have taken a 3-1 ALCS lead by beating the Yankees in Game 4. 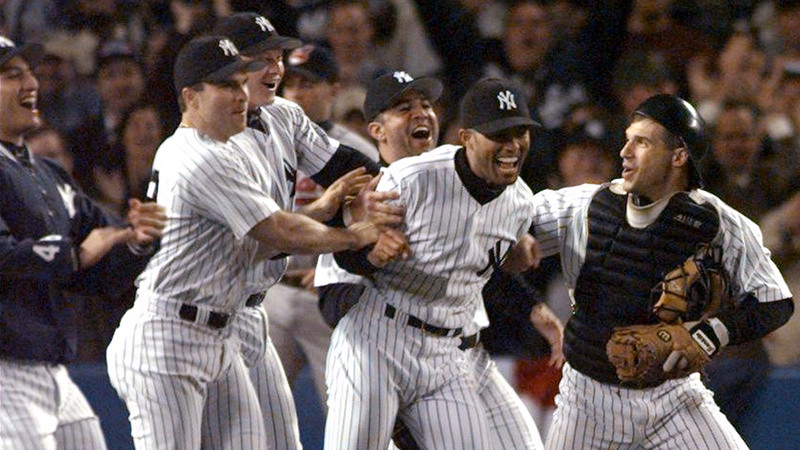 But Orlando "El Duque" Hernandez combined with Mike Stanton and Mariano Rivera for the shutout to even the series. The next day, Yankees starter David Wells gave up a home run to the first batter he faced, Kenny Lofton. Then he allowed a Manny Ramirez sacrifice fly. But Wells was tough, holding the Indians to just one more run and picking up the win in what would be a banner postseason for the left-hander. He had picked up the decision in the Yankees' Game 1 win, and after his Game 5 win gave the Yankees a 3-2 series lead, Wells -- 2-0 with 18 strikeouts -- was on his way to ALCS MVP. The Yankees clinched it in Game 6 back home in the Bronx, jumping out to a quick 6-0 lead, surviving a five-run Indians fifth that included Jim Thome's grand slam off David Cone -- Thome's fourth homer of the series -- and then securing it on Jeter's two-run triple in the sixth. Rivera finished it off, Frank Sinatra was played in a familiar victory ritual at Yankee Stadium, and the Yankees had 121 overall wins and wanted more. It was shaping up as one of the best teams in Yankees history, and coming from behind in the series to eliminate a powerful Cleveland club only added to its reputation. Next up was San Diego in a unique World Series matchup, and the start of a three-peat.